South Africa has become a popular destination for foreign hunters, especially American trophy hunters. This could create the impression that hunting has been a lifeline for the firearms retail industry. After the Firearms Control Act 60 of 2000 was introduced in 2004, the arms and ammunition retail market fell into a significant decline, and many firearms dealers closed their doors. “After 2004, there was a significant decline in retail sales of arms and ammunition. The number of registered dealers plummeted, from 720 licensed dealers to 80 dealers who were still actively trading following the seriously flawed introduction of the Firearms Control Act,” says Andrew Soutar, SAAADA chairman. The implementation problems of the Firearms Control Act have improved somewhat since 2010, and there have been signs of the market recovering. New firearms dealers have opened. Of the 198 arms and ammunition dealers currently on the Sports Trader database, 30% were added since 2010. Membership of SAAADA also increased from 80 to about 105 active traders in the last two years, says Soutar. Local hunting organisations have also experienced a significant growth in members. “The growth in our membership over the past three years has been 50%, i.e. from 800 to 1 200 members,” says Mike Huber of the Southern Cape Hunters and Conservation Association. But, not all new members of hunting organisations are active hunters. “A large number joined merely to retain their firearms,” he says. The firearms control act allows the licensee to possess a firearm if he is an occasional hunter and sports-shooter. According to section 16 of the act, a dedicated hunter or sports shooter may own up to four licences. In order to prove that you are an active hunter or sports-shooter, you need to belong to an accredited hunting or sports-shooting association and have a sworn statement from the chairperson of the association stating that you are a member. The initial problems with the firearms control act has mostly been sorted out and this has made a big improvement to sales, says Shawn Jacobs of Parow Arms in Cape Town. “The public is now more confident that they will be able to obtain a firearm license,” he says. This encourages them to buy new weapons. Some retailers are very positive about growth in the past few years. “There has been a definite growth spurt in the last few years. I would estimate about 40% growth in the market,” says Hennie Bouwer of Bouwer Broers in Pretoria. “There has been an increase in firearms sales in the past two years,” agrees Nico van Huyssteen from Hunters in Heidelberg. “The industry did grow, but as an estimate I would say not more that 4%”. This is by no means a significant growth, but seeing as the industry has been in decline for most of the past 10 years, this could still be good news. Huntex, which is the largest annual expo for hunting and sport shooting on the continent, also experienced huge growth in the number of visitors as well as exhibitors over the past three years. Visitor attendance has almost doubled, from 19 016 in 2011, to 35 006 in 2013, and Huntex 2014 promises to be even bigger, say the organisers. While this indicates huge public interest in hunting-related products, it is a mixed blessing for retailers. "We have found a trend that buyers tend to hold back for a few months prior to the Huntex Show, as it is perceived they will be getting bargains at that venue,” says Franco Resca of firearms supplier Rescomp Handgun Technologies. But, while its forerunner, The Big Shot show, closed due to waning interest, the well-publicised and competently organised Huntex is proving to be a more than worthwhile opportunity for retailers, as it is possible to recoup all expenses on the first day of the show, with the next two days just generating profit. There are, however, some mixed answers when it comes to whether the firearms retail industry has experienced a growth spurt due to the growing interest in hunting. In 2013, foreign hunters spent R1.24-bn in South Africa, according to a study by North West University, where international hunters were asked to complete a web based survey. This is R400-m more than what was estimated by the Department of Environmental Affairs. The study also found that respondents spent about R184 790 per trip on average, and that about 9 000 foreign hunters come to South Africa annually. Of these hunters, the majority of them come from the United States (88%), with some hunters coming from Denmark, Germany, France and Mexico. There is also an increase in hunters coming from Russia. The American hunting and sport shooting industry has experienced a significant growth in the past five years, and this could account for the increase in foreign hunters coming to South Africa. While the foreign hunters provided a significant income for the tourism and private hunting industry, this unfortunately does not translate into increased sales in the firearms retail sector. “Overseas hunters purchase mainly game packages, transport and accommodation,” says Huber. “Foreigners who come to hunt in SA don't buy their equipment here,” agrees Stan Gordon of the Cutlery Distribution Group, distributor of, among a wide range of hunting knives, including Kershaw, Cold Steel and Victorinox. “International hunters generally bring their equipment with them from overseas, rather than purchase locally,” he says. One of the major problems facing the firearms retail industry is the fact that hunters and sport shooters do not need to purchase new equipment very often. “The average hunter maybe goes hunting twice a year, because it's very expensive,” says Iqbal Barufwalla from Bar Global, local distributor of Wolverine hunting boots. “The hunting boot therefore lasts long. Hunting is also seasonal. A brand has to have other styles in the range that the hunter will want to wear every day.” Grey imports — whereby a company who is not the authorised licensed importer brings in stock not purchased from the official manufacturer or distributor — and counterfeits, are also creating major problems in the industry (see article separate box). The copying of camouflage clothing ranges also created confusion in the industry. Supply of international products is also an issue. “Retailers haven’t been able to fully capitalise on the increase in demand. The American market is very strong, thus it tends to get prioritised by the big brands, creating a shortage of supply in South Africa. This, along with the weakened rand has increased purchasing costs,” says Soutar. Customers looking to purchase firearms are also limited, as the firearms act limits the number of rifles that active hunters may own, although it is more than the average member of a household. Laws that may be changed in the future is also a big worry for retailers. “Nobody knows what to expect from future regulations, because the authorities are very quiet about what they are planning,” says Bouwer. This could mean that while it is sometimes difficult hunters to purchase new firearms, it is still easy to refurbish their firearms with accessories. “Meat hunting by local hunters is by far the greater portion of the market — trophy hunting is mainly for the overseas market,” says Huber. Products relating to this kind of hunting, such as hunting and skinning knives, are therefore good stock options. A typical hunting knife would incorporate a gut hook, but an outdoor knife, which could also be used for skinning, would not, he explains. 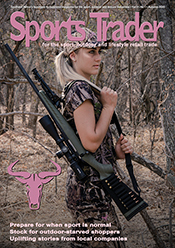 “In our area, ammunition, rifles, handguns, reloading equipment and powder are all selling well,” says Van Huyssteen. “There is nowadays a larger diversity in affordable sports-firearms and ammunition. The average biltong hunter has more choice in international brands, such as Howa, Winchester, Remington etc.,” says Bouwer. The SA Arms and Ammunition Dealers Association (SAAADA) is busy compiling a list of the authorised South African importers of firearm and firearm accessory brands in order to address the current problems with grey imports and counterfeits. This list will enable retailers to comply with the Consumer Protection Act (CPA) that require them to indicate clearly when a product they sell did not come from the licensed importer – failing which, they could receive a heavy fine. Grey imports are not illegal, provided that the dealer clearly indicates to the buyer at every point of the transaction that it is an unauthorised branded product and how this could impact the buyer, explains Franco Resca of Rescomp Handgun Technologies, who is compiling the authorised brand distributor list for SAAADA. While non-compliance with the CPA can expose a dealer to receiving a heavy fine, selling counterfeit imports can result in a more fatal outcome. Resca mentions the example of a copy of a holster from an established brand that is so badly made that it started falling apart when they inspected it. “If you carry a gun in it and it falls apart, you could accidently shoot someone,” he says. If the firing mechanism on a tactical firearm used by, for example, a policeman fails, it could be fatal for him in a shootout. Apart from the fact that dealing in counterfeit goods is a punishable offence, the retailer that sold the inferior quality accessory or defective firearms could be held liable for any injuries – or fatalities — caused by the product. In order to protect themselves, Resca therefore urges retailers to ensure that they only sell products supplied by the authorised brand distributor. This might be more expensive, because he has to pay a licensing fee and conform to certain standards, but the products will carry the brand owner’s guarantee of quality and safety. Contact Resca on sales@rescomp.co.za or SAAADA chairman Andrew Soutar at Andrew@classicarms.co.za.